In memoriam Setsuko Hara. Part of the Criterion On Hulu film club, Late Spring may be streamed by Hulu subscribers. Late Spring is easy to enjoy, though the ending is hard. Hara plays her typical devoted daughter. She doesn't want to marry, although everyone pressures her to. She eventually relents and accepts a match only because she thinks her father, Shukichi played by Chishu Ryu, will remarry and have someone to take care of him. Hara simply enchants the camera. The twinkle in her eye is expertly captured by Ozu. She also conveys her sadness with subtlety and grace. The scene in the Noh theatre is just masterful both in acting and direction. Mainly due to censorship during the occupation, the war is mentioned as a thing that has happened but nothing is really revealed about how the characters feel about it. Noriko spent time in a labor camp, though it is only spoken of in passing. That does explain why she isn't anxious to marry and move out of her father's house. The most interesting observation about the picture is the ubiquitous western fashions and furniture. 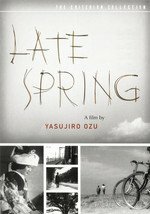 Ozu explores a fascinating dichotomy between traditional and modern in this way. Shukichi sleeps and works in typical Japanese rooms and is most often shown in Japanese clothes. The young women, Noriko and her friend, played by Yumeji Tsukioka, are nearly always shown in western clothes and using western furniture. It's generally thought that the final scene shows Shukichi overcome with grief. I must admit that the first time I saw it, I thought he died. I just realized I accidentally forgot to finish my thought. It should read, "In doing so, he showed the struggle of Japan itself in trying to honor the old ways while acknowledging the need for change."